For many years, licorice root has been used widely in traditional Chinese medicine in the treatment of indigestion and stomach discomforts. 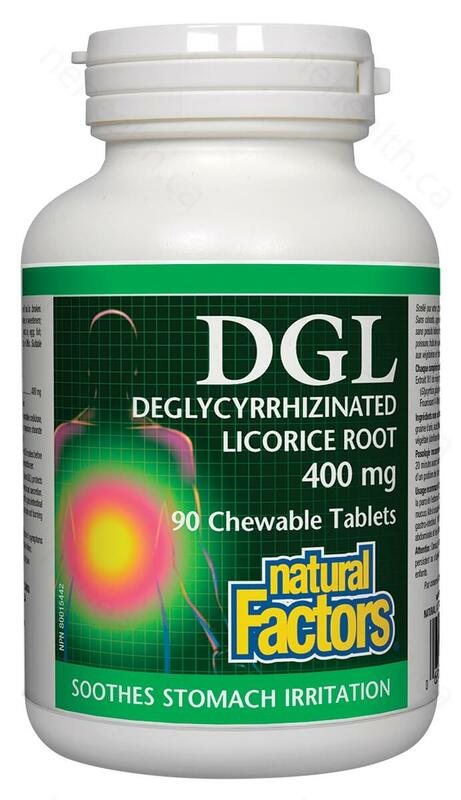 DGL stands for “deglycyrrhizinated licorice”, it is an extract of licorice root where the glycyrrhizin has been removed so that it is completely safe to take for everyone including people with hypertension. DGL is an anti-ulcer compound that inhibits the formation of gastric and duodenal ulcers and alleviates damaged and inflamed mucous lining. Studies show that the flavonoids in DGL are effective in inhibiting the growth of harmful H. pylori (Helicobacter pylori) in our stomach. 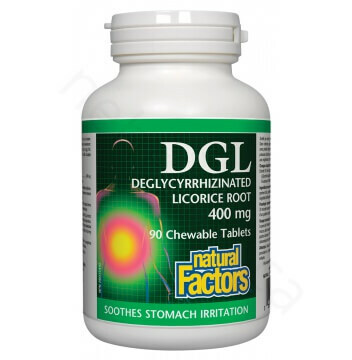 Natural Factors DGL is a safe digestive aid to take before every meal and works better than any other antacids in the market. Non-Medicinal Ingredients: Xylitol, microcrystalline cellulose, anise seed, stearic acid, vegetable grade magnesium stearate (lubricant), silica, Stevia rebaudiana leaf. Chew 1 tablet daily 20 minutes before each meal or as directed by a health care practitioner. Rees, W. D. W., et al. "Effect of deglycyrrhizinated liquorice on gastric mucosal damage by aspirin." Scandinavian journal of gastroenterology 14.5 (1979): 605-607.